It’s unashamedly derivative, and £4k is not cheap, but we love it! 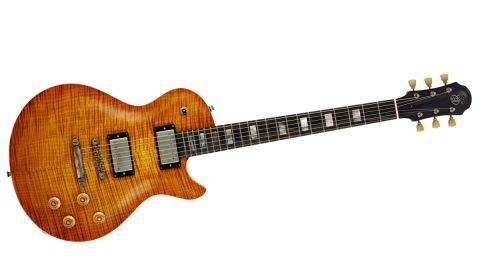 “I wouldn’t presume to improve upon a Les Paul,” exclaims Patrick Eggle when asked about his latest creation, the Macon Single Cut. No prizes for guessing the inspiration, but as a hand-maker Patrick has the advantage of adaptability, making various build options available. We agree, often finding semi-hollow guitars to have crisper trebles, warmer lows and a degree of scoop to the middle - hence those funky tones you’ll find on an ES-335. Acoustically, this one certainly sounds loud and responsive, open chords resonating like a bell when struck. Getting to a Les Paul’s upper frets is a problem for many and was a main point of concern for Patrick, hence he’s chosen a ‘slipper’ neck-to-body joint. Essentially, it’s like a Fender-style joint but glued not screwed and with an extended ‘foot’ to create extra glued surface area. “It’s very robust,” says Pat. in nitrocellulose) and figured ebony ’board and headstock overlay with ‘black mother-of- pearl’ inlays. Real ebony pickup surrounds and switch knob provide a classy finishing touch. Patrick has researched everything from pickups and hardware right down to makes and types of pots and switches, and is particular about the tiniest details. “Pickups are hand scatter-wound by Marc Ransley at Mojo,” he says. We love the feel of these pots, as they roll effortlessly under the fingers. In fact, we love all Eggle’s choices regarding this Macon Single Cut; the almost pewter-like nickel tune-o-matic, the ABM bell brass tailpiece and even the Gotoh tuners look spectacular, too. The neck’s finish (an open-pore acrylic) feels warm and natural on a profile whose dimensions are perfectly judged - neither too bulky nor too skinny. Some necks, like a pronounced ‘V’ or a big U-shaped clunker, can make too much of a playability statement, whereas we’re seeing more and more makers opt for something that doesn’t impact on the player in any way. And that’s most pleasing. Fretting, as on every Eggle we’ve seen, is flawless. These are Jescar medium-tall frets and, on the 629mm (24.75-inch) scale and accessible action, feel like mother’s milk to all your blues, pop or rock requirements. Without a non-chambered Macon to hand, we conscripted our Gibson Les Paul Custom to the sonic fray. We’ve tried these Mojo pickups on previous Eggles and they really do suit the guitars well. While the Gibson displays all the expected traits - unbridled power, girth and grunt - the Macon SC is a subtler beast. There’s guts aplenty when you wind up the wick, matching even our Black Beauty, but even without the coil-splits, the range of tones is remarkable, especially if you experiment with the guitar’s controls. We’ve said before that in coil-split mode these pickups’ innate tone is retained, but just a tad more airy and expressive whether playing tight rhythms, clean arpeggios or dirtier riffs. Terms like ‘airy’, ‘headroom’ and ‘clarity’ all suit the Macon SC well and we can’t fault it on playability or tone. Patrick’s work is never less than exemplary, and the level of build, fit and finish here is almost without parallel. He sits in rarified company alongside a handful of small makers capable of combining a fantastic aesthetic eye with attention to detail verging on the obsessive, and build quality to match anything on the planet. His guitars are extremely easy to bond with, and this one’s amazing looks, fine tones and perfect setup made it several close friends during its all-too-brief sojourn. And even tipping the four grand mark, we can’t fault it. It’s an honest, value-for-money product and you can see that value in every facet, from materials and parts to its simply superlative build.